NHL News : Ovechkin drops the gloves and KOs Svechnikov! This just in: Alex Ovechkin is now the heavyweight champion of the NHL. 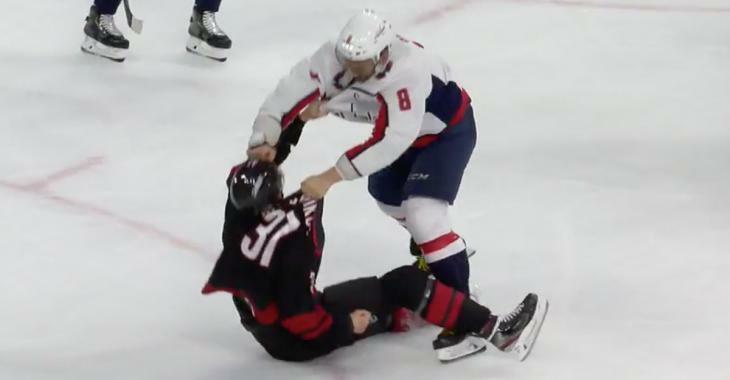 Midway through the first period of tonight’s pivotal Game 3 between the Carolina Hurricanes and Washington Capitals, Ovechkin absolutely TUNED UP Hurricanes rookie Andrei Svechnikov. Ouch... bad idea, rookie. Ovi absolutely DESTROYS Svechnikov in this one. The Hurricanes, unsurprisingly, have announced that Svechnikov will not return for tonight's game.